Beth Townsend is a native of Richlands, Virginia. She is a graduate of the University of Tennessee in Knoxville, Tennessee, receiving a Bachelor of Arts degree with High Honors in 1983, and a Juris Doctor degree in 1986. She was admitted to practice in Tennessee in 1986, where she practiced with the firm of Lowe & Shirley from 1986-1988, and the firm of Baker, McReynolds, O’Kane, Shea and Townsend from 1989 until she moved to Texas in 2000. While practicing in Knoxville, she was active in the Knoxville Bar Association, and was a Master of the Bench in the Hamilton Burnett chapter of the American Inns of Court. 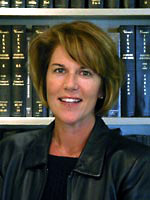 In 1999, she received the Tennessee Bar Association’s Law Through Liberty Award. She also took Mediator training in 1994, and was on the panel of approved mediators in the USDC for the Eastern District of Tennessee as well as all Tennessee state courts. In September 2000, Beth joined the Law Firm of Jackson & Sjoberg as Of Counsel, and became licensed to practice law in Texas later that year. She immediately began working with the Firm’s oil and gas and mining clients. Beth has provided substantial legal support for clients in the areas of property acquisition, title and land, lease management, mine permit application and mine-related activities. Beth became a partner of the firm, renamed Jackson, Sjoberg, McCarthy & Townsend, L.L.P. effective January 1, 2012, and continues as a partner in Jackson, Sjoberg, & Townsend, L.L.P., effective January 1, 2017. Beth worked with the Chairman of the Railroad Commission of Texas, the Bureau of Economic Geography, and the FutureGen Texas Alliance in a bid to bring the FutureGen Alliance, Inc.’s near zero emissions power plant project to Texas. She assisted FutureGen Texas in drafting its “Best and Final Offer” for the Jewett Plant Site. In 2008, Beth successfully negotiated a settlement for a Tennessee claimant against a Texas insurance company in receivership in the first attempted rehabilitation of an insurance company under the Texas Insuror Receivership Act. This was a case of first impression construing the rehabilitation provisions of the Act. Beth has been a speaker at meetings of the Texas Mineral Land Association on specific topics of interest, including the identification and relocation of abandoned cemeteries in Texas, the FutureGen project, and the future of “green” energy.